Commvault, a global leader in enterprise backup, recovery, archive and the cloud, announced a strategic partnership with Hewlett Packard Enterprise (HPE) to deliver Commvault healthcare solutions to HPE customers. Through this reseller agreement announced today, HPE and its global network partners will now be selling fully integrated and pre-validated versions of Commvault’s portfolio of healthcare solutions on HPE infrastructure. These solutions include Commvault Clinical Archive and the Commvault Data Platform to protect and manage critical MEDITECH, Epic and other EHR data, as well as medical images across the healthcare enterprise, with a fast, simple and comprehensive solution. Today’s announcement was made at HIMSS18, being held March 5–9, in Las Vegas. These new Commvault healthcare solutions extend the scope of the HPE Complete Commvault Software offering, enabling healthcare customers with industry-leading data protection that is tightly integrated and optimized for HPE Storage and other infrastructure products, including HPE StoreOnce, HPE 3PAR, HPE Nimble Storage, HPE Apollo, and HPE Proliant. The introduction of Commvault Clinical Archive on HPE infrastructure is the first enterprise medical image management solution HPE has brought to the market, and is designed to simplify access to - and management of - imaging data created in disparate PACS solutions.
. Commvault Clinical Archive – Combining clinical archiving with a comprehensive data management platform, Commvault Clinical Archive transforms vendor-neutral archiving (VNA) into a complete “enterprise image archiving” solution, and simplifies access to - and management of - data created in disparate PACS solutions. Commvault Clinical Archive provides the flexibility to archive medical imaging data on premises, in the cloud, or in a hybrid storage solution. It ensures all archived data is readily available for use by clinicians; the archive can be configured to deliver relevant historical studies identified with a DICOM modality worklist or HL7 ADT interface. Plus, the open platform supports all common data standards — DICOM and non-DICOM images — as well as PDFs, JPEGs, annotations, and more. Because it is based on the Commvault Data Platform, data can be moved to the cloud with ease. 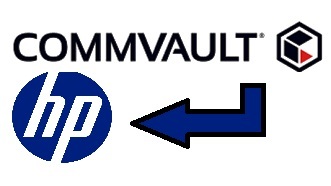 Commvault’s clinical archiving capabilities also provide a simple, cost-effective way to manage, migrate and retire legacy PACS applications.
. Epic, MEDITECH, and other vendor-agnostic EHR Data Protection – Automated snapshot management is at the heart of Commvault’s EHR data protection. The array-based storage hardware snapshots are integrated directly into the data management platform for seamless protection of data for all EHR systems and sub-systems. Entire file systems and databases can be recovered within moments of failure — mitigating the risk of patient information loss. HPE and Commvault will both be exhibiting at the HIMSS18 Conference & Exhibition, March 5-9, 2018 in Las Vegas. Commvault will be at number 8001. HPE will be at booth number 2127.